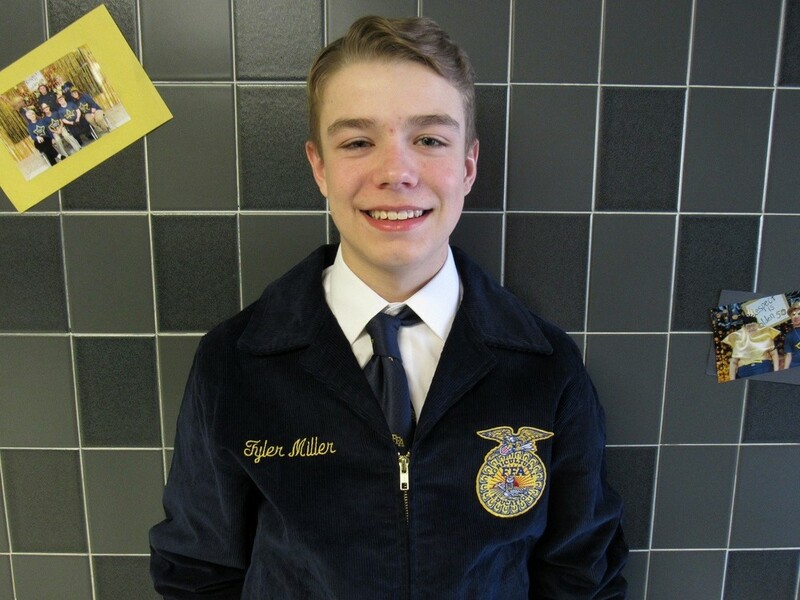 Freshman FFA member, Tyler Miller, was selected as the April member of the month for the Olympia FFA. He was selected for his participation in FFA activities, such as being a member on the Parliamentary Procedure Team. Olympia High School FFA member of the month awards are made possible by Dietrich Builders Inc.
Tyler is the son of Jay Miller of Armington and Tara Miller of Atlanta. This is Tyler’s first year in FFA. Throughout his freshman year, Tyler has participated in activities, such as grilling pork chops, and events, such as Parliamentary Procedure, which is his favorite. Tyler’s supervised agricultural experience (SAE) includes cattle production. When asked about his future, Tyler stated, “I know I want to be involved in agriculture and more specifically with livestock. I especially enjoy calving season and competing in the show ring.” Thank you Tyler for your dedication to our chapter and for being an excellent member! And thank you Dietrich Builders for giving us the opportunity to recognize members of the month!